Since 1951-52 when the Congress won the first Lok Sabha election in Independent India, its powers had been fairly unchallenged. The party faced internal differences and had even faced a split but no other political party had been able to give a tough fight in any of the five elections. 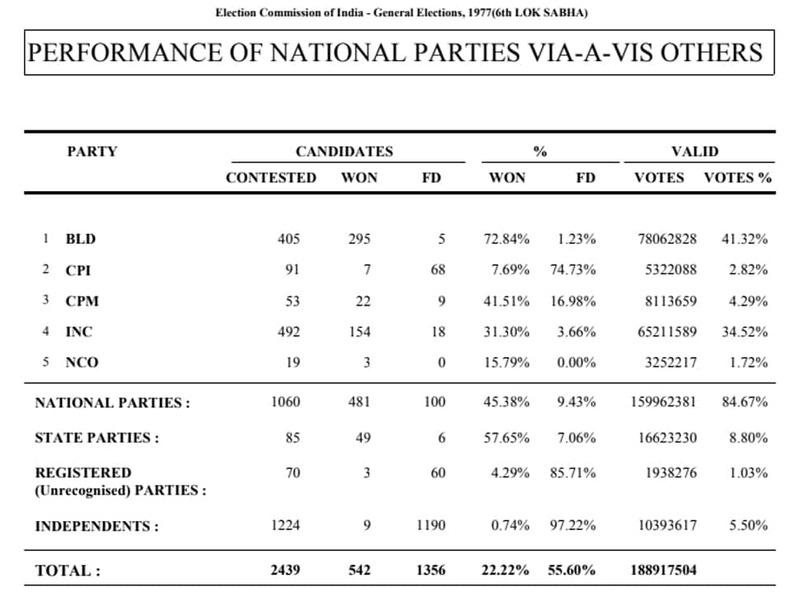 But the story of the 1977 Lok Sabha election was different. In 1971, Indira Gandhi had been confident of her victory and had called a mid-term election. She was proved right and she came back to win with a landslide majority to become the prime minister. She had thought that she would have the similar fate when she called a mid-term election in 1977 but she was proved entirely wrong when the results came out. She suffered a crushing defeat at the hands of Janata Alliance – as part of which all opposition parties had come together with the sole objective to bring an end to the Congress regime. The fifth Lok Sabha, which was to be dissolved in March 1976, was extended twice since the Indira government had imposed Emergency in the country since January 1975. The state of Emergency ended after a period of 21 months when the extended session was dissolved on 18 January 1977, 15 months prior to the expiry of its extended term. The voting for the election was held between March 16 and 20, 1977. Enraged by Indira’s authoritarian rule during Emergency, four main non-Communist opposition parties – the Organization Congress (also known as the Opposition Congress), the Jan Sangh, the Bharatiya Lok Dal and the Socialist Party – decided to join hands and contest the election together as part of a single party. The combined party was to be called the Janata Party. For the first time in India’s electoral history since Independence, the Congress lost its majority in the Lok Sabha. The Janata Party emerged triumphant with a landslide victory winning 295 of the 405 seats it contested on with a vote percentage of 41.32. The Organisation Congress also bagged 3 seats taking their winning seat share to 298. The Janata party, which had fought on the Bharatiya Lok Dal’s symbol, trounced the Congress and formed the first non-Congress government of independent India with Morarji Desai as the prime minister. Desai, who was previously India’s finance minister before Indira removed him in 1969, was one of the veteran leaders who had been imprisoned for nearly two months during the Emergency. Other parties in the Janata Alliance included The Communist Party of India (Marxist) which won 22 seats, 3 less that it won in the previous election. The other parties which were part of the alliance were Shiromani Akali Dal which won 9 seats, 8 more than the last election; Peasants and Workers Party of India which won 5 seats, Revolutionary Socialist Party which won 3 seats, All India Forward Bloc with 3 seats, Republican Party of India (Khobragade) with 2 seats. Two Independents also gave its support to the Janata alliance. The Dravida Munnetra Kazhagam which sided with the Janata party suffered a major setback losing on 22 seats from the past election and winning just one. The Congress, on the other hand, faced its worst defeat in 30 years, managing to win 154 of the 492 seats it contested on with a vote percentage of 34.52. The result showcased a clear North vs South divide among those who voted in its favour and those against. In the North Indian states of Bihar, Uttar Pradesh, Haryana and Himachal Pradesh, the party could not even win a single seat. Uttar Pradesh which was the biggest state in terms of the Lok Sabha seats had been a Congress stronghold since the first election but Indira’s calculation in the 1977 election turned out to be wrong and she could not even win one out of the 85 Lok Sabha seats. However, in the south, the party did fairly well. Of the 154 seats that the party won in the country, 112 were from Andhra Pradesh (41), Maharashtra (20), Karnataka (26), Tamil Nadu (14) and Kerala (11). Its allies also won 9 seats in Kerala taking up the tally in these states to 121. The pro-Congress Communist Party of India won 7 of the 91 seats it contested on, 16 less than its tally in the 1971 election. Altogether 2,439 candidates had contested in the election for the 542-member House. The Lok Sabha seats had been increased from 518 in the previous election on the basis of the 1971 census. The Janata party had fought the election on issues ranging from domestic problems to the civil liberties which had been curtailed during the Emergency and forced sterlisations which were done during the period. The Congress, with an aim to come back to power, focussed on the need for a strong central government. After the Congress debacle, the Emergency was revoked on March 21 and Indira resigned as the PM to pave way for Desai, India’s first non-Congress Prime Minister, to take the oath of office on March 24. The reasons for Emergency may be aplenty but what triggered is widely believed to be a court verdict that ruled against Indira. On 12 June 1975, the Allahabad High Court convicted Indira of electoral malpractices and imposed a six-year ban on her holding any elected post. The case was filed by socialist leader Raj Narain, who challenged her victory in the 1971 Lok Sabha election from Rae Bareli Lok Sabha seat in Uttar Pradesh. Narain who had been defeated by Indira had alleged electoral malpractices and violation of the Representation of the People Act, 1951. On June 18, the Congress appealed to Indira to remain in power stating that her leadership is indispensable for the nation. She filed an appeal in the Supreme Court against the HC judgement and on June 24, got a breather in the form of a conditional stay order. The apex court allowed her to remain in power and continue as the prime minister. The very next day on 25 June 1977, Indira imposed Emergency. On the same night, almost all Opposition leaders were put behind bars under the controversial Maintenance of Internal Security Act (MISA) which was passed by Parliament in 1971. The Shah Commission report on the events during the Emergency, dealt with how the Press was silenced during the time, the police actions which were taken, the conditions of the prison, the torture that was meted out to people, the role of Indira’s son Sanjay Gandhi, and family planning atrocities. The Commission, based on its findings, concluded that there was no economic crisis and no crisis of law and order prevailing in the country on the basis of which such an extreme measure was needed. “The decision to arrest and release certain persons were entirely on political considerations which were intended to be favourable to the ruling party. Employing the police to the advantage of one party is a sure source of subverting the rule of law,” a report by the Commission stated. Defending her government’s decision for taking the action, Indira in a television interview in 1978 said that there were internal as well as external challenges which made it imminent for her government to recommend Emergency. “Had it been only internal with no foreign interference one could have dealt with in a much easier way,” she had said. She had also categorically dismissed the findings of the Shah Commission report calling it ‘prejudiced’ and ‘completely one-sided’ adding that Justice Shah had in the past also had expressed himself very strongly against her and her government policies. Indira’s son Sanjay, who was seen by many as Indira’s advisor, faced much criticism for his role during Emergency. Though he did not hold an official post, he had quite a say in the government decisions. So much so that after Indira launched her 20 point programme, he launched his own 5-point programme as well which was later merged and changed into a 25-point programme. The forced sterilization program under the family planning initiative to limit population growth was highly condemned by many who called it ‘authoritarianism’. 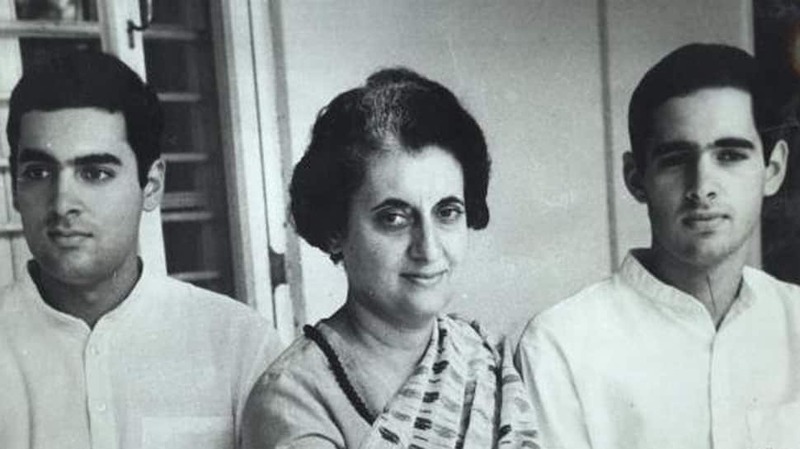 Owing to the excesses during Emergency, Indira and Sanjay received the biggest setback in the 1977 election when both lost from their Lok Sabha constituencies – Rae Barelli and Amethi respectively. While many thought that the 1977 election was the end of Indira and the Congress, the 1980 election had something much different planned for her.